Sometimes, the foundation of your home needs to be stabilized before the home is completely constructed. That is where our residential foundation shoring services come in. 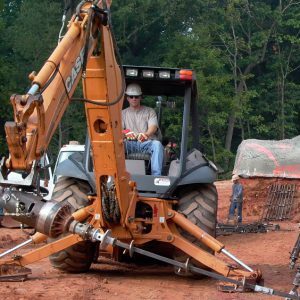 The Atlas team offers experienced personnel with our industry’s state-of-the-art precision products and equipment for shoring. We ensure foundation stability during construction, demolition, or reconstruction to keep you and your family safe. The services that we offer include residential excavation shoring as well as new construction shoring. In addition to providing support for new construction, it is often necessary to shore existing structures and excavations. Conventional shoring systems are not always feasible due to noise, time or vibration constraints. Our underpinning products, however, can provide the reliable results without the drawbacks of other shoring methods. Shoring is commonly used when installing the foundation of a building. A shoring system, such as steel push piers, will support the surrounding loads until the underground levels of the building are constructed. 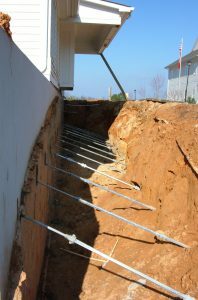 Shoring methods such as this can also be used to repair your foundation. Your foundation may fail due to unexpected forces, such as soil movement or excess moisture. We use quality foundation repair products that can re-position your foundation to its originally designed plan and lift the structure of your building to its original state. Helical Tiebacks are a type of shoring product that we often use. We offer the very best in helical tiebacks from the industry’s leaders. These tiebacks work like large screws, and are installed laterally to apply horizontal pressure that holds the foundation in place. Helical tiebacks are also very versatile, and can be used in many different situations. If you have any question, or need assistance with your foundation project, please give us a call. One of our professional staff members will be happy to answer all your questions regarding residential shoring. Whether it is a new construction project or a foundation repair project, count on the experts at Atlas Piers of Atlanta. We will make sure you project is done fast, safe, and on budget. Call us today! For information on specific case studies, click below.